Location: Route 190 a few miles east of western park boundary at the north end of Panamint Valley. Services: Camping, restaurant, small store, lodging. Comments: Nice view of Panamint Dunes. Public wireless network available at no charge. Location: Route 190 near the middle of DVNP. Services: Camping, restaurant, general store, lodging. Comments: Hotel rooms are about $100/night for a small room up to $160/night for a deluxe room. Limited Wi-Fi is available for guests only. Often no ranger is present at the ranger station here. Location: Route 190 a little southeast of middle of DVNP. Services: Camping, restaurant, general store, lodging, museum. Comments: This is the largest facility inside the park with over 280 rooms between the two hotels. There is also a large visitor center and there's even a golf course. Location: North end of park near Nevada border. Services: Day use only with tours, food, and souvenirs available. Comments: Tours of Scotty's Castle are not available year around. Mesquite Spring Campground is a few miles south of Scotty's Castle. Location: Highway 178 about 30 miles east of Highway 395 and Ridgecrest, approximately 20 miles west of DVNP. Services: Restaurants, small general stores, lodging. Gas: About 20 to 30 cents above statewide average. Comments: Gas is usually available in Trona, but in the last two years there have been several months during which no gas was available. Currently there are two gas stations. One has newly installed pumps. Location: Intersection of NV-374 and US-95, a few miles east of DVNP. Services: Lodging, restaurants, general stores, gambling. Gas: Multiple stations and reasonable prices. Comments: The eastern end of Titus Canyon Road is only a few miles west of Beatty. Rhyolite is also nearby. Location: Intersection of Route 190 and Route 127, a few miles east of DVNP and about about thirty miles west of Pahrump. 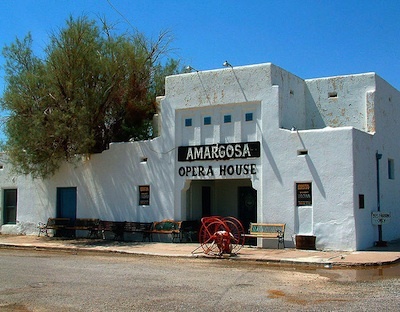 Comments: The Amargosa Opera House is located here. 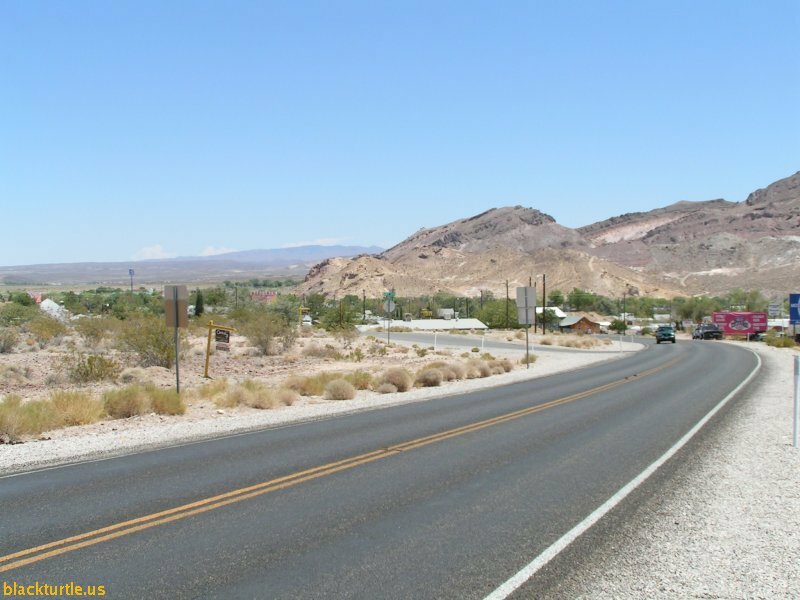 Location: Route 127 about 27 miles west of Pahrump, 57 miles southeast of Furnace Creek, and 56 miles north of Baker and Interstate 15. Services: Lodging, restaurant, general store, museum. Comments: North of Shoshone is an interesection with Route 178. Here visitors can turn west onto 178 and enter DVNP via Jubilee Pass or continue north to Death Valley Junction. Location: Drive 29 miles north on US-395 from Kramer Junction and Route 58. 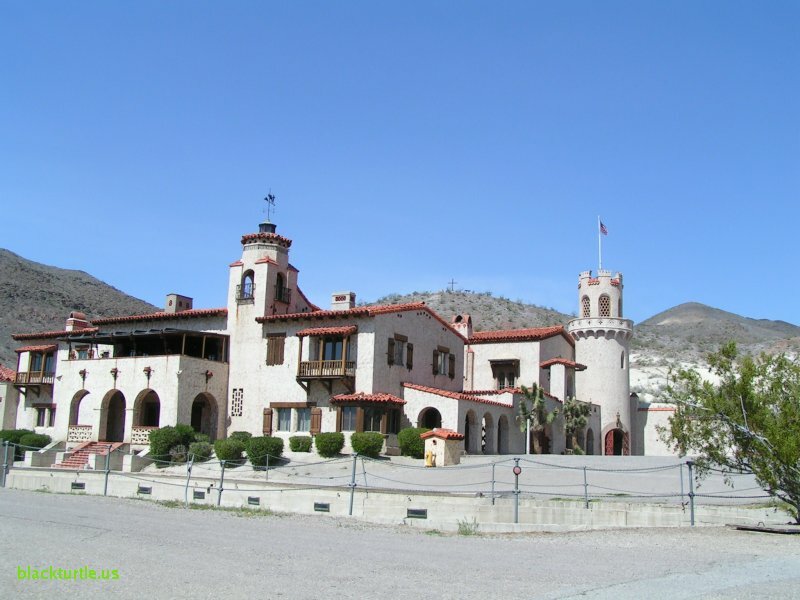 Services: Lodging, restaurants, general store, assorted shops, lodging, museum. Comments: Randsburgh, Johannesburg, and Red Mountain clustered together and it is Johannesburg where the gas station is located. Location: Drive 48 miles north on US-395 from Kramer Junction and Route 58. Services: Lodging, restaurants, grocery stores, general stores, museum, etc. Gas: Several stations to choose from with reasonable prices. Comments: Ridgecrest has many restaurants, a Wal-Mart and a K-Mart, tire stores, and an outdoor supply store. Location: Drive 121 miles north on US-395 from Kramer Junction and Route 58. Services: Lodging, restaurants, grocery store, general store, museum. Gas: Slight mark up in price from Ridgecrest. Comments: Location of the Eastern Sierra Interagency Visitor Center. Also a great place to gas up if entering Saline Valley via South Pass. Location: Drive 136 miles north on US-395 from Kramer Junction and Route 58. Services: Lodging, restaurants, small stores, camping. Comments: Consider purchasing gas at the Fort Independence Casino and Petrol Station. The prices are lower than in Ridgecrest. Independence is a great place to gas up if traveling up Mazourka Canyon. Location: Drive 163 miles north on US-395 from Kramer Junction and Route 58. Comments: Gas up here if driving east on Route 168 on your way to Saline Valley via North Pass, if visting Eureka Dunes, or driving up to the White Mountains to spend time at the Bristlecone Pine Forest. Location: Drive 178 miles north on US-395 from Kramer Junction and Route 58. Services: Lodging, restaurants, grocery store, general store, shops, camping. Comments: Great place to gas up if traveling north on Route 6. If you are planning on climbing Boundary Peak, then this will probably be your last reliable and inexpensive gas stop. Location: Drive 58 miles northwest on NV-160 (Blue Diamond Road) from Las Vegas. Services: Lodging, restaurants, grocery stores, general stores, shops, museum, etc. 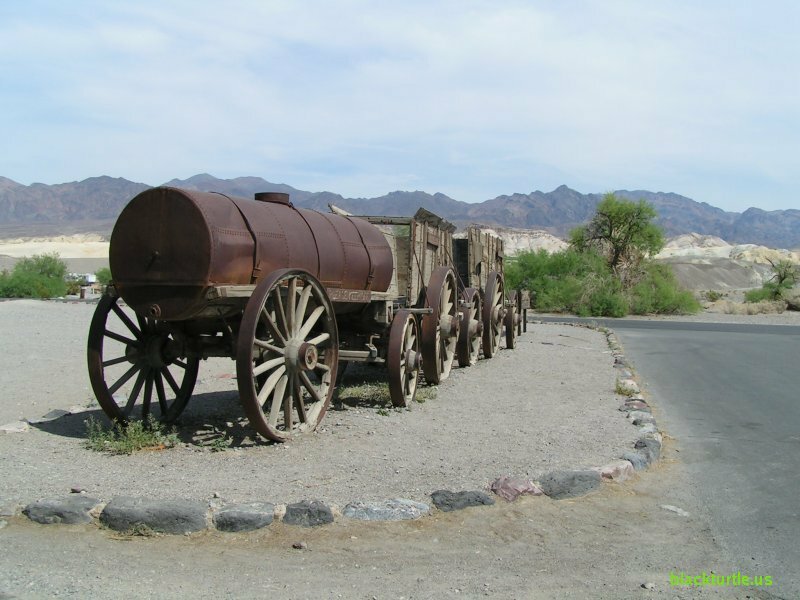 Comments: Pahrump is a great place to gas up if visiting the southern portion of Death Valley National Park. Location: Drive 188 miles north on US-95 from Las Vegas. Services: Small general store, shops, interesting sites of historical interest, and not much else. Comments: Not much in this town, but it is an interesting place to visit. 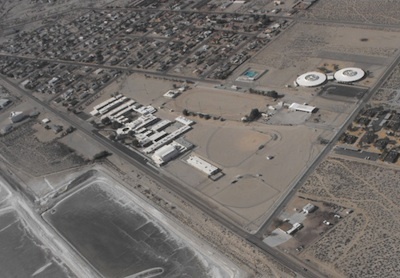 Although there are few services, Goldfield does have it's own Elementary and High School. Location: Drive 214 miles north on US-95 from Las Vegas. Gas: A few gas stations. Comments: This is not a strategic place to gas up unless you are visiting areas east of the White Mountains. Location: Drive 38 miles east from Lone Pine. Take CA-190 to Darwin Road and then drive 5.5 miles into town. Comments: Interesting to stop by while visiting the Coso Wilderness, Darwin Falls, or the Lee Flat area. Location: Drive 25 miles north on Trona Wildrose Road and turn right onto Ballarat Road. Comments: Although no services are listed, a general store operates some of the time. However, it probably is not wise to rely on it for anything. Location: Drive 83 miles from Bishop. Start by taking US-6 north for 57 miles and then turn south onto NV-264 and drive another 26 miles. 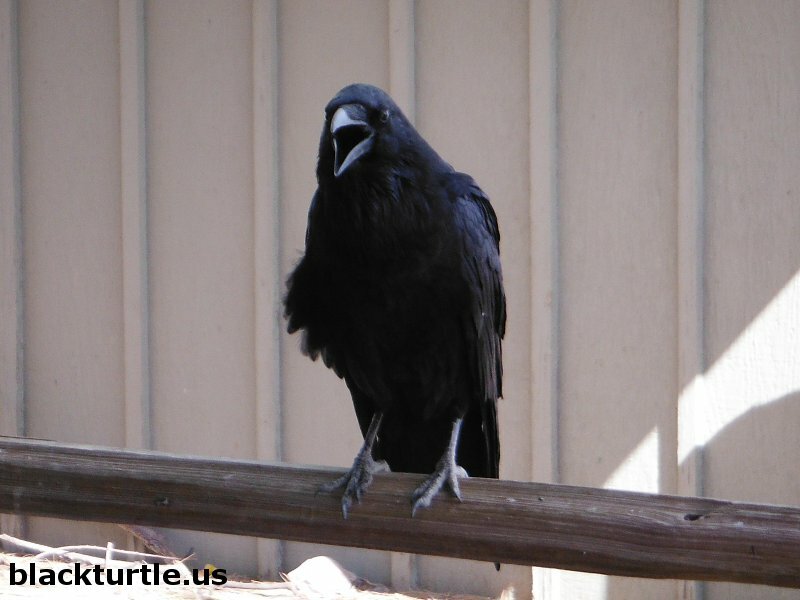 Services: General store, camping, RV park, cabins. Comments: If you plan on climbing Boundary Peak, this is a good last stop, although it would be best to gas up in Tonopah or Bishop. Location: Drive north 52 miles on CA-127 from Baker. Comments: The hot springs are the main attraction! 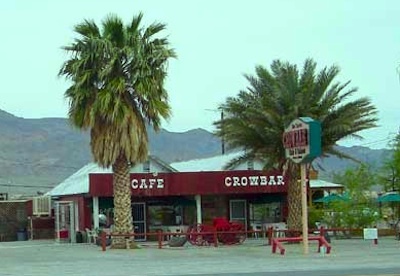 Location: Drive 64 miles northeast from Barstow on Interstate 15. Services: Restaurants, general store, lodging. Comments: Home of the world's largest thermometer, Baker is a good place to gas up if you are traveling from the south and plan on entering DVNP via Shoshone.